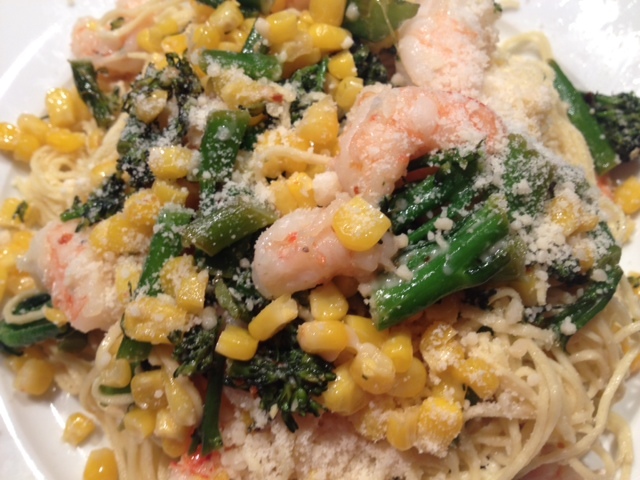 Sweet & Spicy Shrimp Pasta. Now that the weather is getting warmer, I’m even more inclined to cook with fresh and bright ingredients! 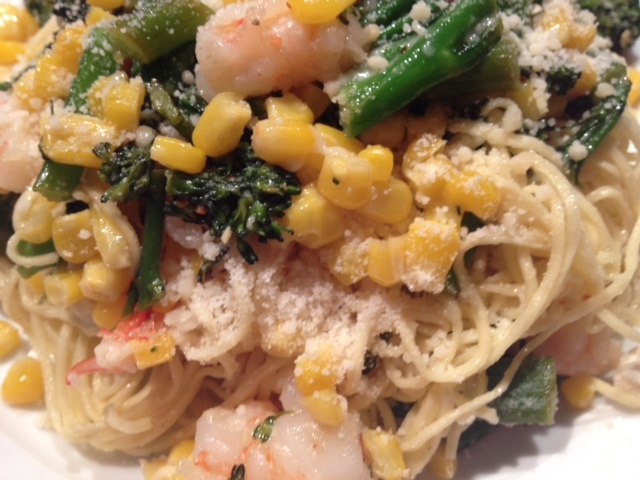 This colorful pasta dish is a treat, made with fresh pasta, and has tons of different flavors. 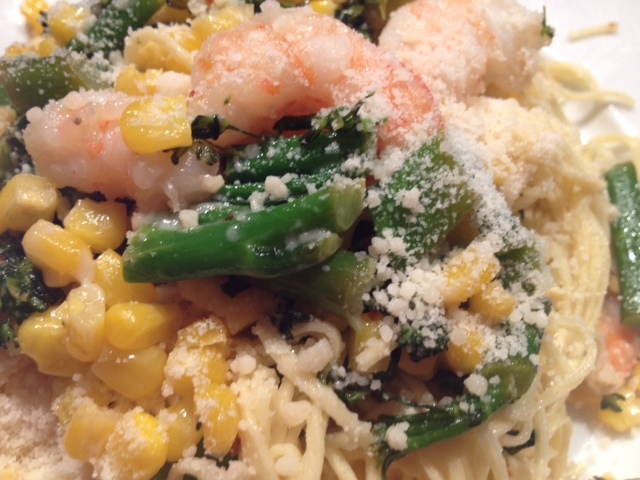 The spice from the garlic and hot pepper blends so well with the subtle, sweet taste of the shrimp and corn. In a pan, heat 2 tbsp olive oil on medium heat. Add in the crushed garlic and hot red pepper flakes, allow this to simmer in the olive oil for about 1 minute. 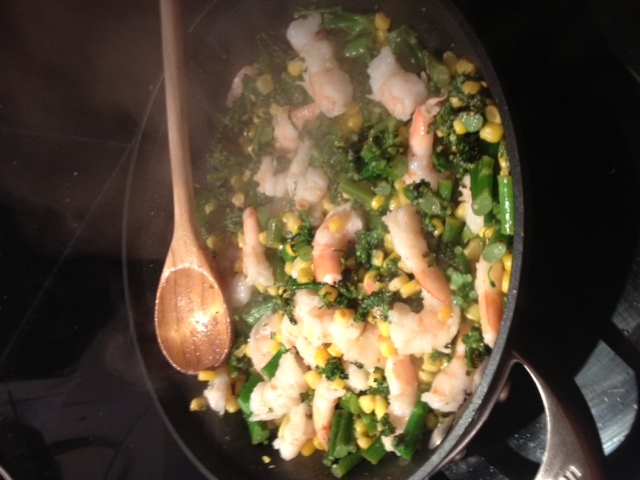 Then add in the broccolini and corn and cook for about 5 minutes. At this point, add in the chicken stock to help steam the vegetables. Cook for an additional 10 minutes. Lastly, add in the shrimp and put the lid on the pan for about 2-5 minutes to heat the shrimp. Because the pasta is fresh, it only takes about 1 minute to cook. 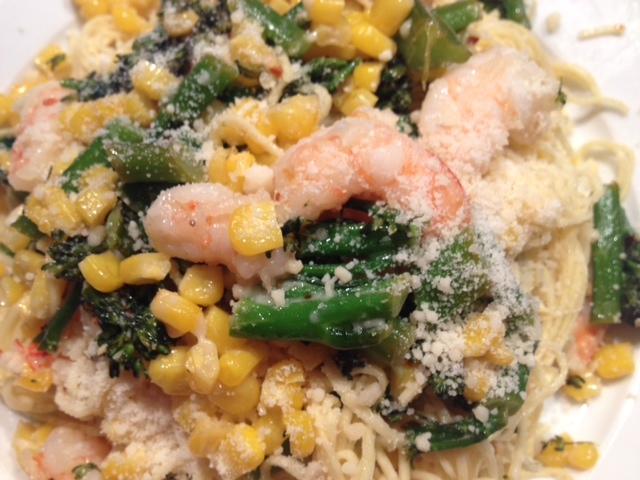 After you drain your pasta, add it back into the pot and put the broccolini and shrimp mixture over top with the Parmesan cheese and a generous dash of garlic salt. Toss to combine all the ingredients. If you like heat, you can add in a bit more hot red pepper flakes at this time as well. ← A Lunchtime Feast At Socca.